We didn’t want to say it, but summer is practically over and back-to-school is right around the corner. (Don’t shoot the messenger!) Because we know you’ve already been bookmarking your favorite shoes and gadgets to ring in the new season, we’ve rounded up the best backpacks to help kick off your back-to-school shopping extravaganza. Whether you’re looking for functionality in the Ju-Ju-Be convertible diaper bag or extreme comfort with the JanSport Big Student backpack, there’s something for everyone on your list ― even yourself! When looking for classic back to school gear, nothing other than the beloved L.L. Bean comes to mind. Their durability and versatility is what makes their products, especially their backpacks, a must-have when thinking about a new season. The Original Backpack was introduced over 30 years ago, yet it’s still one of their most popular backpacks for elementary school students because of its large main compartment for lunch or books, front pockets, lightweight design, and newly added water bottle feature. It’s perfect for ages 6 and up, making it the ultimate back-to-school backpack for a tyke. When that school supply list is filling up with binders, books, gadgets and more, JanSport’s Big Student backpack is there for you emotionally, mentally and physically. 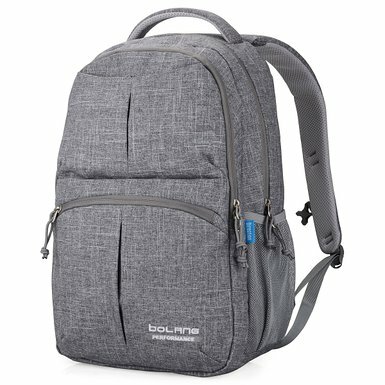 With two large compartments for versatile storage, ergonomic S-curve shoulder straps for comfort, and two zippered front stash pockets, this backpack is the perfect option for a busy teen who is looking for style yet functionality. While you may not want to admit, you need a backpack in college. But we know you don’t necessarily want to walk around with a 50-pound boulder attached to your back. That’s where the sleek design and hidden functionalities of the Bolang backpack come into play. Not only is it made of durable nylon material, but it has three front packets for smaller gadgets and a large multi-compartment design that can hold a 16″ computer. You can thank us for saving your street cred later. This sophisticated backpack by Tumi will keep up with your busy lifestyle through its simplistic and minimalist design. With its zip-round closure, it has interior pockets to help organize your laptop, personal items and any electronics with ease and care. If you’re looking for a versatile backpack that’s professional yet chic enough for business, everyday, and travel, then this is a great option. Looking for something similar that’s under $100? Try the ‘Settlement’ Backpack by HERSCHEL SUPPLY CO. Similar to Tumi, it’s got a classic design and padded features built for comfortable commuting. You don’t have to sacrifice looks for comfort when it comes to the ‘Kånken’ Water Resistant Backpack. This iconic backpack is created from “durable, water-resistant Vinylon F™ fabric making it the perfect travel pack to keep valuables like your camera and electronics safe when outdoors. And just when you thought a diaper bag couldn’t look stylish, Ju-Ju-Be came in and stole the show. This bag was designed with comfort and convenience in mind, from it’s outer fabric that has Teflon fabric protection and a zippered front “mommy” pocket that will hold almost all of your accessories. Did we mention it has crumb drains? This is a clear no-brainer for when you want the best of both worlds.